…including the long-awaited Link of the Year! Ladies and Gentlemen, we have a winner for “Link of the Year”. But first let’s look at the other nominations. As always, our Friday afternoon concerns were: 1) Humour, 2) Political Activism and 3) Humourous Political Activism. 2006 was the year was Amazon started allowing ordinary people to write reviews of basic groceries such as milk and fruit. Hilarity ensued! Tom Heath recommends two ways to feel politically empowered again. One is Karma Banque, which targets unpopular companies by lowering their share price, selling short options on their stock, thus raising money. 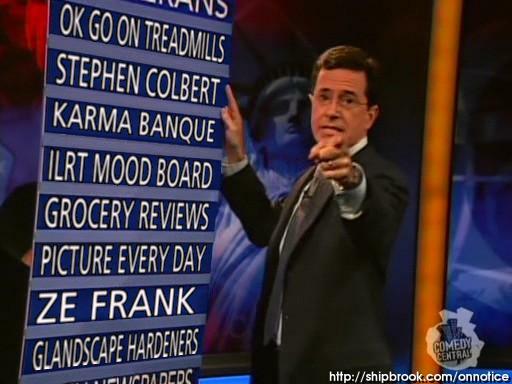 As runner-up to Link Of The Year, we surely must give a special personality award to American comedian Stephen Colbert. He has been connected to a number of things we’ve featured over the year, but his finest moment so far has to be the telling off he gave George W. Bush at the White House Correspondents’ Dinner. “Fantastically inventive pop video and a strenuous workout to boot.” says Chris Mitchell. Thanks for reading, everybody, and Happy 2007!